1. Cheap work now leads to expensive fixes later. 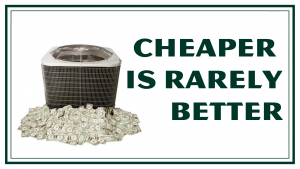 Your cooling & heating system is the most expensive, mechanical investment you will make in your home. Too often we visit client’s homes who picked the cheapest company to install or service their equipment. They are now left with poor workmanship leaving them uncomfortable & out of money. Cutting corners & performing the bare minimum are often what allows companies to charge so little now but, unfortunately, you’ll pay for it later. 2. Technicians with licensing & training aren’t cheap. Hiring, retaining & training the best team members is expensive! The alternative? A cheaper, less skilled team member who lacks training servicing your home. HVAC technicians are required to be licensed. Your cooling & heating system work closely with your gas, electrical lines & refrigerant. It is no easy task & you do not want an unlicensed technician messing with those dangerous elements of your home. A license guarantees you are in safe hands that know what they’re doing. It’s important to hire a cooling & heating company who is up-to-date on all state-of-the-art technology & methods of servicing & installing your equipment. Receiving certifications & attending training sessions is not cheap but will help the technician be more knowledgeable about ways to save you money, make your home more comfortable & able to fix what is broken when the time comes. 3. Excellent service isn’t cheap. It’s easy to call the “chuck in a truck” who is cheap & can get the job done. However, many times when you call he doesn’t answer, gives you a six-hour window when he may arrive at your home. His truck & uniform are dirty & unkempt. Even worse, you call him with an emergency & he can’t get to you for days. Companies with excellent service have a team well equipped to answer every phone call, give you specific appointment times, arrive at your home in a clean truck & uniform whenever you need them. Overhead grows as a company grows but so does the level of service provided & that is worth every penny! 4. Trust & integrity are priceless. Lastly, trust your gut. You can sense when someone is not being truthful but wouldn’t it be nice if you didn’t have to worry about any of that? Having a technician working in your home who you can trust to not only be honest with you but also work hard with integrity to ensure you & your home are safe is a priceless feeling. We do not want you to have to handle any more headaches than you must. We don’t say all this to get your money or steal you from the competition. We say this because our team at Daffan wants to make sure you are well taken care of by a team who cares about you & your home. We understand we are not the cheapest company in town, but we do understand the art of excellent service. We are committed to serving with trust, integrity & hard work. That is what makes Daffan your home’s best friend.